Oral health is an important component of general health and should be maintained through a woman’s lifespan. 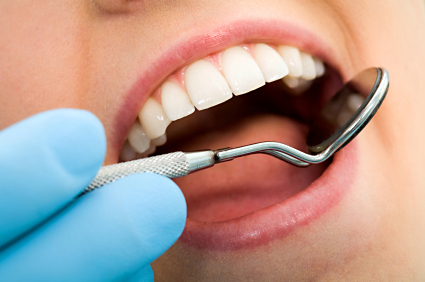 Maintaining good oral health may have a positive effect on cardiovascular disease, diabetes, and other disorders. menopause. The use of oral contraceptives can contribute to these changes as well. Women rate their general health significantly better than their oral health and attribute more importance to healthy teeth for their babies than for themselves. This is not supposed to be so. Research also has it that a certain saliva test could detect breast cancer. See how important our mouth is? As if puberty isn’t hard enough, the surge of hormones that accompany puberty can also contribute to dental problems. Girls going through puberty are very likely to experience swollen, sensitive and bleeding gums, especially during their menstruation cycle. It’s also not unusual for ulcers and Herpes type lesions to occur on or in the mouth during puberty. The increase of hormone levels during pregnancy can cause dental problems to be intensified. One of the most common dental problems associated with pregnancy is a condition known as pregnancy gingivitis, which usually occurs during the first trimester. If you’re pregnant, your dentist needs to know about the first signs of gum disease symptoms. Pregnant women are at increased risk for periodontal disease because the increased levels of progesterone that come with pregnancy cause an exaggerated response to plaque bacteria. As a result, pregnant women are more likely to develop gingivitis even if they follow a consistent oral health care routine. Gingivitis is most common during months two to eight of pregnancy. Symptoms of pregnancy gingivitis are usually bleeding, swollen, red and tender gums. Morning sickness can also contribute to dental problems because tooth erosion can occur from the acid that is caused by vomiting. Some women going through menopause experience a burning sensation in their mouth as well as red, swollen and tender gums. It’s also not uncommon to experience dry mouth during this time. Some hormone medications taken during menopause can also contribute to dental problems. Since oral contraceptives contain estrogen and progesterone, they imitate pregnancy. With the body believing it’s pregnant, women taking birth control pills may experience gingivitis. Women who take birth control pills are also twice as likely to develop a dry socket, according to the Academy of General Dentistry. ■ Visit your dentist for regular check ups and cleanings. ■ Be sure that you inform your dentist of all medications that you are taking, as well as any of the life changes mentioned above. ■ Brush your teeth properly at least twice a day to remove plaque. ■ Floss your teeth daily. Flossing will remove food debris from in between the teeth that a toothbrush can’t reach. ■ Use an antimicrobial mouth rinse. Antimicrobial mouth rinses can help prevent gingivitis. ■ Brush or scrape your tongue daily to help remove bacteria. ■ Eat nutritious meals and healthy snacks. ■ Talk with your doctor about possible side effects of any hormonal medications that you are taking. ■ Tell your dentist when you are pregnant — he or she may recommend more frequent dental cleanings during the second trimester or early in the third trimester to help combat the effects of increased progesterone and help you avoid gingivitis. Understanding how these body changes affect your oral health can give you a head start against preventing dental problems before they occur.